This summer has been insane and my blog posts have become less and less frequent. I apologize for that. Work and life have kept me busy, but I always try to save some time for reading and working on my next book. I am currently working on my next book about a witch. This book has required more research than usual because I didn't know much about witchcraft. 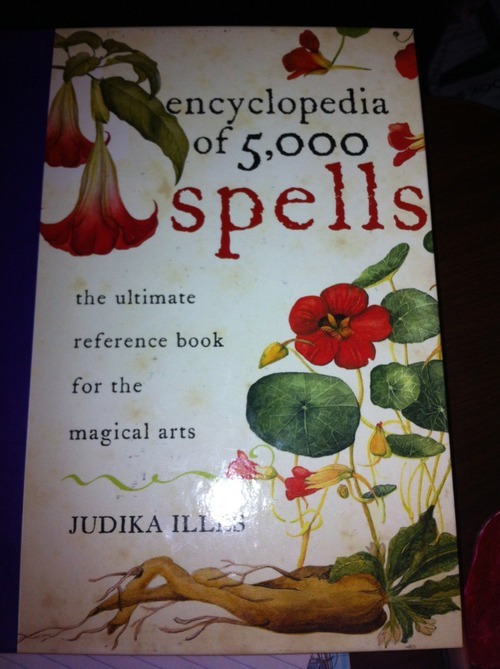 One of the wonderful books I got was call The Encyclopedia of 5000 Spells by Judika Illes. This is a wonderful book for me because I can find all kind of magical mischief for my protagonist. It is also wonderful because it offers a vast collection of spells and folk remedies to prevent and end hauntings from around the world. I thought I would put a couple of these wonderful spells here for all those who are struggling with a haunting and looking for a supernatural remedy. If you want more remedies, you'll have to buy the book because it has enough ghost away spells to clean out a cemetery. These few are just the tip of the iceberg. 1. Burn bistort, waft the fragrance through the home and reserve the ashes. 2. Pour boiling water over the powdered herb. 1. Braid a strand of unbleached wool and a strand of red wool together. Use red wool that will not bleed into the other strand. The finished strand should be long enough to tie around your forehead. 2. Make seven knots in the braid, while focusing upon your desires. that ghost that haunts me can't come back again." 5. Afterwards, carry it as a talisman, in a charm bag. 1. Sprinkle a strong infusion of bayberry inside and around the perimeter of a house to exorcise existing ghosts and repel new ones. For added power, asperge with a bay laurel branch. 1. Place a small doll in a tiny coffin. 2. Have a great send off for the doll. 3. Bury the coffin in a remote area or in a cemetery. That book looks great! I'm fascinated by folk spells and remedies for banishing spooky things.